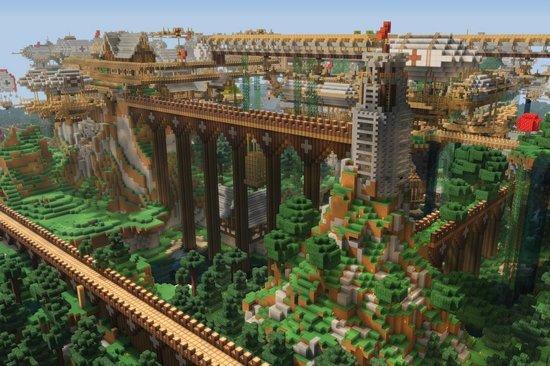 Rate this Article Almost everyone in the gaming world has heard of the incredibly popular sandbox game, Minecraft, but how many gamers have gone out on a limb and learned the story of its success? When Swedish programmer Markus “Notch” Persson started working on the game that was to become Minecraft, he was thinking of a computer game that young people as well as he would love to play. So he started working on a 3D building game that used objects made of blocks. Notch was already a game programmer when he started with his pet project. Taking his cue from a game called Infiminer, Notch started coding the game using Java and was able to have a working test version by May of 2009. Everything was done in code as Notch didn’t use any 3D modeling programs for his block like creations. The games idea was to build and tear down Lego like cube structures in a virtual environment made out of cubes which resulted in a creative open world sort of game. The game was playable at this stage but was not yet released to the public and was called the pre-classic version. As 2009 rolled on, the classic version was then released on a server. This was still basically a test version which Notch continually updated with features like Multi-player and eventually Survival Test mode. Not only could you build but other people could join you. Also, you had the option to play on a survival type environment where you really had to build and perform task in order to survive. Initially called Cave Game, it was renamed to Minecraft: Order of the Stone and finally just Minecraft. By the end of the year, the game had a community of around 100,000 registered users. The following year 2010 was a very decisive year for the game. The first 6 months focused on updates to the currently running platform. They were called the Indev and Infdev stages successively. Additional features like the Crafting System and the introduction of infinite maps that go on and on where introduced as well as the 5-pound premium account. By the end of June in the same year, the Alpha version of the game was released. By then, Notch had left his day job to work on Minecraft full time along with his friends JahKob and Carl Manneh. The premium price was raised from 5 to 10 Pounds and many new features where only available to account holders. This stage in the development lasted through the year from Ver 1.0 all the way to 1.2 in stages. The project had expanded to the point where Notch and his friends had to create and register their company Mojang just to handle Minecraft development alone. By the end of the year, access price was raised once again from 10 to 15 Pounds though old registered users where not charged any additional extra. Both Beta versions 1.0 and 1.1 were also released successively. By 2011, Beta ver 1.2 was released. Minecraft had surpassed over 1 million sales. Notch and the Mojang team focused on the stability of the game as well as adding additional content and polishing the game play. Beta version 1.3 to 1.8 rolled on throughout the year. By July 2011, Minecraft had around 10 million registered users. On November of the same year, the Beta stage had been completed and Minecraft was officially released as a complete game meaning it already had an ending and was ready for reviews and ratings. 2012 marked the continual rise of the game from release versions 1.1 to 1.4. Minecraft was also ported to both Android and IOS mobile platforms. Modding was also introduced into the game. 2013 marked versions 1.4 to 1.6 and introduced Minecraft to console gaming for the Playstation 3, 4 and PS Vita. The game had surpassed 13 Million sales. 2014 marked version 1.7. Minecraft was released for the Xbox One and on September of that year, Notch Persson sold Mojang and Minecraft to Microsoft for a whopping 2.5 Billion dollars. The other Founders of Mojang finally left the company along with Notch. By 2015, the Minecraft community was sort of an angry mob. The game was however at ver 1.8 and was being released for the Xbox 360 as well and being developed for the Microsoft Holo Lens. Xbox was also made available to Windows 10. 2016 marks the release of versions 1.9 and 1.10 of the game. Minecraft introduces story mode later down the road and further released the game for other platforms like the Wii and the Mac. Thus goes the story of Minecraft from its early beginnings as a pet project by now a very rich programmer to the most popular, purely-sandbox game in terms of sales. A simple game of putting together blocks in order to build things to a huge complex sandbox world development game which has attracted millions of players to try it out and eventually get addicted to it. Minecraft has no age limit as children to senior citizens became involved in this multiplayer world which everyone could share. Today, now in the hands of Microsoft, time will tell if Minecraft will rise further or eventually subside to the world of the classic computer game. However, from what we can see via Microsoft’s Hololens demos and the fact that you can now play the game in virtual reality bode well for the future of Minecraft for decades to come.